Tibet is currently in the focus of the Chinese central government’s efforts to improve the heating situation of the population. The lack of space heating in many buildings in the region, which is subject to a continental climate marked by cold winters, has prompted China’s government to support the installation of solar district heating systems. 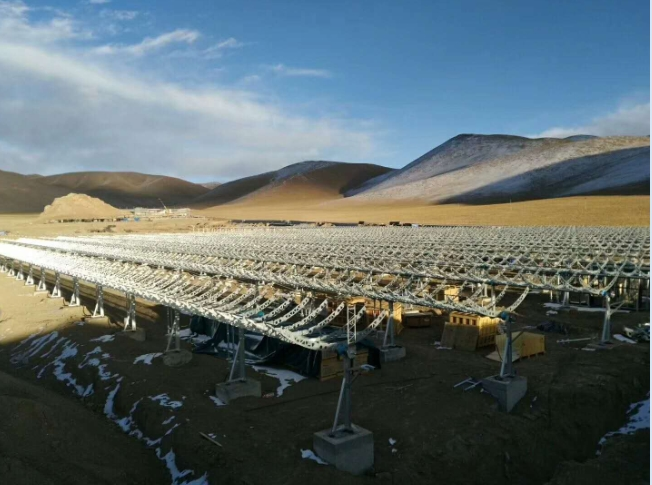 In addition to Chinese-Danish joint venture Arcon-Sunmark Large-Scale Solar Systems Integration, Chinese parabolic trough collector manufacturer Vicot Solar Technology has signed a contract with the local government to install a solar district heating system in the autonomous region of Tibet. The photo, taken in November 2017, shows one-third of the field’s substructure. The entire installation will have 18,000 m2 of aperture area which is defined as the flat, rectangular area specified by the outer perimeter of the mirrors. The parabolic collector field is being installed in Shenzha county. Ouyang Cheng, Marketing Manager at Vicot Solar Technology, said that half of the collector field had already been completed in 2017 and that the remaining 9,000 m2 would be set up this year. The collector field will run on thermal oil and will be connected to a district heating system. Vicot said that it planned to install a molten salt storage tank and use electric boilers for backup. The company did not provide any further technical details on the project, which is being funded by the Chinese government. Reportedly, it has been contracted only to build the solar collector field but not the new district heating system. 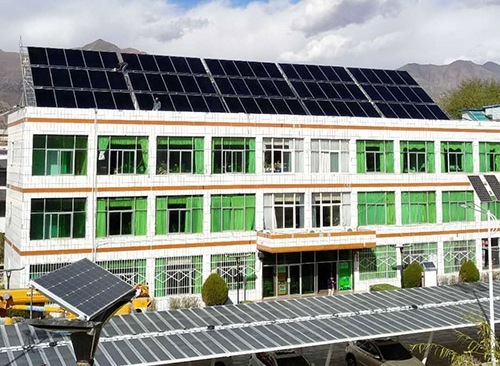 A region such as Tibet, which has abundant solar resources but high demand for space heating and which offers generous subsidies from the central government, is also of interest to other domestic collector manufacturers. On 28 November 2017, Tianpu New Energy Technology signed a cooperation agreement with the Tibet Energy Research and Demonstration Center during a seminar on solar heating systems in this mountainous part of China. Tianpu, traditionally a manufacturer of coated vacuum tubes and vacuum tube collector systems, began producing large-scale flat plate collectors in the middle of last year. Its new collector model has been used for a 570 m2 system to heat the Tibet Energy Research and Demonstration Center (see the photo below). Around 100 stakeholders attended the seminar to discuss issues such as clean energy policy, green finance, solar district heating technology and market growth. The aim of the organisations involved is to design environmental friendly technologies for Tibet. The first outcome has been a solar energy and gas boiler heating system developed jointly by Tianpu and the Tibet Energy Research and Demonstration Center. It has since been installed in Lhasa.